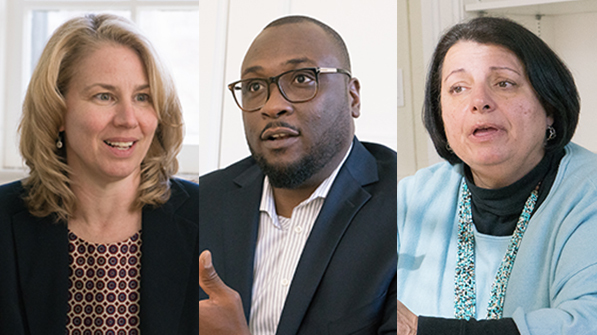 Three working groups were launched this winter to review existing efforts to foster greater diversity and inclusivity among students, faculty, and staff and to strengthen and continually assess efforts in these areas at Dartmouth. On May 2, they will submit their recommendations to an executive committee consisting of President Phil Hanlon ’77, Provost Carolyn Dever, Executive Vice President Rick Mills, and Vice President for Institutional Diversity and Equity Evelynn Ellis. After a series of open forums and consultation with the community concerning the recommendations, the executive committee will present a diversity and inclusivity action plan by the end of spring term. The committees are a faculty working group, chaired by Denise Anthony, vice provost for academic initiatives; a student working group, co-chaired by Rebecca Biron, dean of the College, and Inge-Lise Ameer, vice provost for student affairs; and a staff working group, chaired by Ahmed Mohammed, director of talent acquisition for human resources. Earlier this term, Anthony, Ameer, and Mohammed sat down to talk about what they have been learning in their committees. (Biron was unable to attend the session.) Here is an edited transcript of the discussion. Dartmouth Now: Tell us a bit about the work your groups have been doing. Inge-Lise Ameer: Our group of students, faculty, and staff are reviewing all of the documents that have previously been written on this topic at Dartmouth and then looking at best practices at other campuses, and we’re formulating recommendations. We’ve asked people to do a lot of work in a short time. Ahmed Mohammed: Nobody wants to come up with another report that’s not going to work, so I think the groups are very intentional in saying, “How can we present some really good and clear recommendations for the College?” We’re going to be very focused, strategic, and very direct. Denise Anthony: The charge is to look at what we are doing, make recommendations about how to track and be accountable for these processes, and then add recommendations for the things we aren’t doing now. Anthony: Each group’s recommendations go to the executive committee, which will take that information and come up with a plan for Dartmouth. Also, we are all committed to transparency; that’s why you see this large-scale, open working-group process. It’s not to be done behind closed doors. We want to see change happen at Dartmouth. DNow: Students of color constitute almost 51 percent of students accepted to be members of the Class of 2020. What does this say about diversity? Anthony: Population dynamics are changing in the United States, so our student body is the most diverse population on campus. That’s important, but if we’re not getting the inclusion piece right, if people really don’t participate, feel like they belong, can succeed here in all of the different ways that matter, then we aren’t achieving the goal of really being an excellent institution for students, for faculty, and for staff. Mohammed: If students are not meeting enough people who look like them, and who they can interact and engage with, then how do they feel included as part of what’s happening? Anthony: Another issue is that when we don’t have enough diversity in the faculty in various fields—not just by race and ethnicity but by gender and sexual identity and the other ways we think about diversity—then any one person leaving creates a real hole in the community. Mohammed: One of the ways in which we’re looking at developing diversity is by engaging with other organizations, affinity organizations, and professional organizations. For instance, we have recently invited the Association of African American Women in Higher Education to campus in August for their annual conference. This is the first of its kind here at Dartmouth. This event will bring a whole group of diverse professionals who may not have considered Dartmouth as a place to work in the past. Anthony: Faculty recruitment also has to be very active in developing relationships with institutions, with networks, and with organizations. Programs like the Mellon Mays Undergraduate Fellowships are very active in getting our undergraduates engaged and thinking about graduate school, for example, up through PhD programs, and we have many postdoc programs. The Society of Fellows is another example. It offers us an opportunity to bring people here from a diversity of fields and backgrounds, and it’s also a way for us to be part of that pipeline for developing faculty for academia in general. That’s an important role. DNow: What have you learned so far? Ameer: We’re learning that you have to offer a variety of options and make all of those options as equal and inclusive as possible. What I love about the new house system is that everybody belongs. I hope that that will lead to more integration in social life and build stronger communities. Anthony: What inclusion means is that the community recognizes and celebrates difference. It doesn’t try to wash it out, but says that those differences, in addition to what we have in common, make us better, stronger. Ameer: Dartmouth students care a lot about their experience, what it means to be a Dartmouth student, and I think we’re taking those things to the next level in this process. Anthony: There is also a great deal of interest among alumni to see Dartmouth go to this next level and really be a more inclusive campus. Ameer: I am impressed at how interested and engaged people are in these topics, how much passion they bring to the issue. Mohammed: People seem to feel that there’s really going to be something done differently this time.